Motorcycle Museum - Win A Bike! 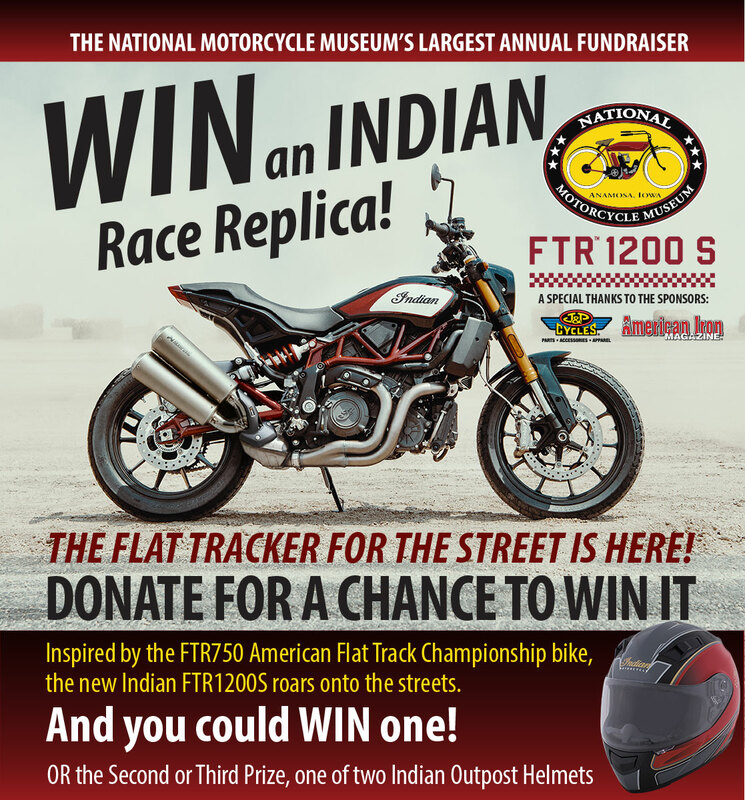 Show Your Support of the National Motorcycle Museum: Donate to WIN the 2019 Indian Race Replica FTR 1200 S” or one of two Indian Outpost Helmets! We are drawing the winner for the FTR 1200 S on December 31, 2019 and you COULD WIN IT or either of Second and Third Prizes, one of two Indian Outpost Helmets! Due to Iowa State Law, we cannot accept credit or debit cards for Giveaway Bike purchases, only e-check, check or money order. Note: We will confirm your on-line ticket purchase via an email which will list your actual ticket number. Your ticket will be put into the drum with other entries, but your actual ticket stub will not be sent to you. The drawing for the three winners*, one motorcycle and two helmets, will be held on Monday, December 31, 2019 at 2:00pm. All website electronic entries must be received no later than December 20, 2019. All mailed entry donations must be received at the Museum by 2:00pm December 31, 2019. You need not be present at the drawing to win. If you include your daytime phone number, we’ll call you if you are the lucky person! Include your email address and we can drop you a note if you win. The non-profit National Motorcycle Museum is one of America’s motorcycling treasures. Large in scale with over 500 motorcycles from over a dozen countries, with diverse collections and interpretive exhibits, it tells the great stories of American motorcycling. So we are always grateful for your support; you have helped make it happen. We hope the new larger facility with more motorcycles, more memorabilia are something you feel part of, something you can say you helped to create through your support. If you would like more information about this fundraiser or other National Motorcycle Museum support programs, please contact us at 319-462-3925. We appreciate your involvement and always look forward to hearing from you! The National Motorcycle Museum is a 501(c)(3) non-profit corporation that relies on donations and fund-raising activities including this program to help preserve and present the exciting history of motorcycling. *The donor for the first eligible ticket pulled wins the FTR 1200 S, the donor for the second and third tickets each win one of two Indian Outpost Helmets!